In August, President Bolton sent a campus wide email explaining that the search process would begin to fill a new position: the College’s first Chief Diversity, Equity and Inclusion Officer (CDEIO). On the expectations of the position, Bolton clarified that the CDEIO will aim to create a vision for a diversified and fair campus and will be involved in making all decisions of the College. Furthermore, this individual will build and lead the implementation of diversity, equity and inclusion initiatives throughout the campus community. The CDEIO will also be tasked with the role of recruiting diverse staff and providing cultural competency training for employees. On track with the projected timeline, the three final candidates have visited campus and taken part in open interviews with members of the campus community, including the general student body, student leaders, faculty and staff. In regard to the purpose of the meetings, Bolton stated, “We hope that the campus visits allow each candidate to meet many members of the Wooster community, which they will find inspiring.” During these events the campus community had the opportunity to meet the finalists, learn about their professional experience and share their feedback on how the candidates would contribute to making Wooster a more diverse, inclusive and equitable community. At the conclusion of each open interview, an anonymous survey was sent to the campus community in order to obtain feedback from faculty, staff and students. The search attracted a pool of over forty candidates. The three finalists include: Dr. Alison Williams, Dr. Ivonne Garcia and Dr. Tayo Clyburn. Currently working as the associate provost for diversity and intercultural education at Denison University, Dr. Williams was the first of the three candidates to come to campus. Dr. Williams’ work includes enhancing the experience and recruitment of faculty from underrepresented groups, maintaining relationships with LGBT groups and the development of opportunities for diversity education and inclusive work environments. Dr. Garcia, the second candidate to visit the College campus, is currently a William P. Rice associate professor of English and literature at Kenyon College and previously served as Kenyon’s inaugural associate provost for diversity, equity and inclusion. Moreover, Garcia has experience with implementing programs to foster diversity, and provide support to underrepresented students and has established the Office of Diversity, Equity and Inclusion at Kenyon. Dr. Clyburn, the final candidate to visit campus, is currently the executive director for mission and strategic partnerships in the Office of Diversity and Inclusion at The Ohio State University. Dr. Clyburn’s work focuses on overseeing The Ohio State University’s diversity action planning process, researched resources and programs LGBTQ students need to succeed. Dr. Clyburn was also an associate editor of race/ethnicity: multidisciplinary global contexts which aimed to instill a space where individuals could discuss topics of global significance. The search committee, chaired by President Bolton, includes representatives of various groups and departments on campus that would be particularly impacted by the CDEIO decision, as well as Board of Trustees member Jilliene Johnson. For example, Associate Vice President for Human Resources Marcia Beasley and Title IX Coordinator/Director of Sexual Violence Prevention and Response Lori Makin-Byrd were both included on the search committee. Likewise, Dean for Faculty Development Peter Mowrey, Assistant Athletic Director for Diversity, Inclusion, Compliance and Internal Management Ashley Reid and Associate Dean for the Center for Diversity and Inclusion Shadra Smith represented other areas of the campus community. 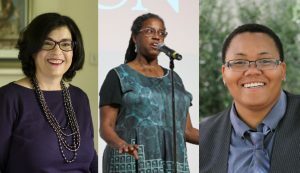 Four professors were also included to give input on the decision: Associate Professor of Women’s Gender & Sexuality Studies/Sociology & Anthropology Christa Craven, Associate Professor of Religious Studies and History Joan Friedman, Associate Professor of Spanish Rikki Palmer and Associate Professor of History Shannon King. Additionally, three students, Gargi Mishra ’20, Maryoti Sosa ’20 and D’Khorvillyn Tyus ’19, were included on the search committee. These students participated in all aspects of the search, including providing input for the initial candidate selection, visiting Cleveland to interview candidates and narrowing down the pool to the final three candidates. Along with the rest of the student body, these students were invited to participate through anonymous feedback regarding the creation of the position, as well as attending open meetings and open interviews with the finalists during their visit sto campus. (Photos from left to right: from Kenyon.edu, from Denison.edu and courtesy Dr. Clyburn).